Knot tying Game! Great for Scouts, Kids, Families, A fun, easy way to learn to tie all kinds of knots! Great game for scouts, camps! 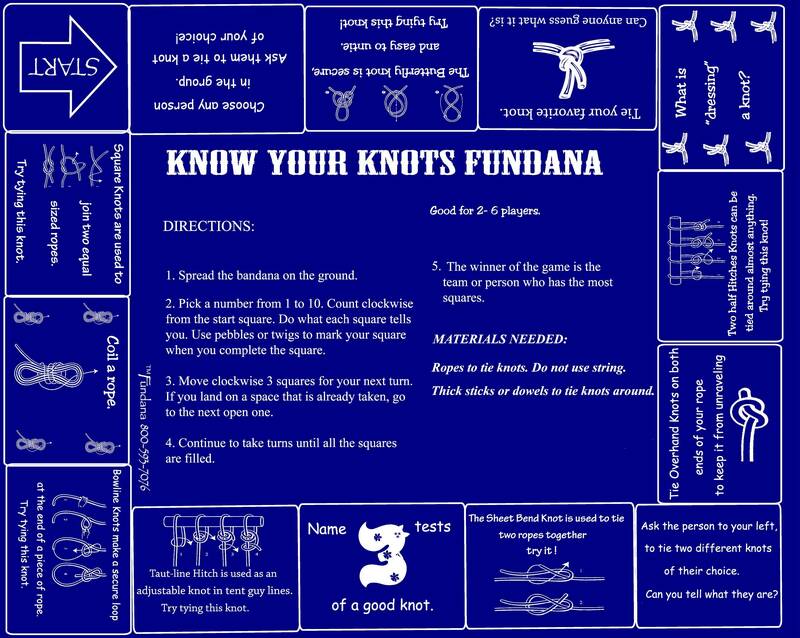 Our Know Your Knots Fundana is a fun, interactive game designed to teach Boy, Girl Scouts or Kids about knots, their purpose and how to tie them. Ropes are required. Great for camps, scout badges and more! The value of this product is that you can make new discoveries every time you play. We do offer a special wholesale price to teachers and Scouts. Please e-mail us at fundanas11 [!at] gmail.com for more information. We also do custom work. If you would like to create your own Fundana, put your logo on our Fundanas, or need a custom bandana we can do it. There is a minimum. Please e-mail us at fundanas11 [!at] gmail.com for more information. Love this. It came on time and its useful.